I would like to talk to you about melissa essential oil. 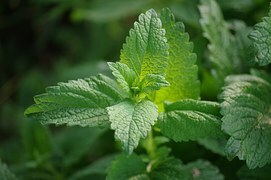 You might know if as lemon balm; perhaps you’ve heard of it? And I wanted to talk to you about this wonderful very rare oil because spring has started a few days ago and it just reminded me of melissa. Just as in spring the light goes up and the darkness goes down (day and night), so melissa too helps you raise the light and really bring out your own light. We all have light inside us and sometimes we forget about that. Melissa really helps that light shine in us. If you feel dark, if you feel drowned by your life, weight down by your life, melissa is a wonderful oil for that. And the reason I say it is a rare oil, it’s because a small bottle (5ml) takes over a 100 pounds of leaves to distill to fill this tiny little bottle. The vibration, the light that is packed inside is amazing; 1 drop goes a very very long way. The way I like to use it is I put a drop either on my arteries (on my neck) or on the tip of the tongue and then I touch the tip of my mouth and I hold it there for a few seconds until it circulates throughout the body. Share this is you find value in it. It (the oil) is a nervine; helps to nourish the nervous system. What it really does it lets Your light shine. So if you feel down, if you feel dark, you feel amazing again. If you have trouble figuring out why you are here, if you forgot why you are here, what you are here for, it is going to help you find out. It is going to help you keep going until you get there. It is a wonderful oil, and I encourage everybody to give this a try; and especially those of you, or if you have a friend, please introduce them to this oil. If you have any questions please reach out to me through email, sign up for my newsletter to stay up to date.